Appearance - Squirrels are known for their large bushy tails and mostly gray coloring, but are not always just gray in color. Squirrels range from brown to gray as well as black and red depending on where you are geographically located in the United States. Adult squirrels are roughly ten inches to a foot long with the tail included in the measurement. Behavior - Squirrels tend to enjoy roaming streets, sidewalks, and property as well as hanging in trees in the area. These are normal behaviors, but sometimes squirrels decide that they’d much rather live inside your house instead of remain outside where they belong. Signs of an infestation may be pieces of insulation or drywall missing from your attic which could be a sign of a squirrel nesting or beginning to nest. You may also see squirrel droppings or smell urine. They may chew electrical wiring. Outside, squirrels will dig up bulbs, chew house siding, and dig holes in the lawn to collect food. Due to squirrels being more elusive when they are nesting, you will probably never find a squirrel that has made it to your main living quarters. It will tend to stay where it is quiet and safe such as a garage or attic. Squirrels tend to enter houses that have trees close to windows leading to attics. If you live near trees where a squirrel could enter your home, then you may be more prone to a squirrel problem. Squirrels tend to come inside in the fall and winter months to keep warm and safe. Attics and garages tend to offer both of those amenities. More likely than not, squirrels are simply looking for a place to nest to keep their young as safe. Outside, they are attracted to bird feeders, trash bins, and fallen food (i.e. berries, acorns, nuts or birdseed). Squirrel infestations left untreated can cause problems for your house and the health of your family. If they are living in your house then they are leaving droppings and urine as well. Both the urine and droppings of any species of animal are cause for concern and as they can carry many diseases. Squirrels are also known flea and tick carriers. One squirrel can have 5 babies every 6 months. 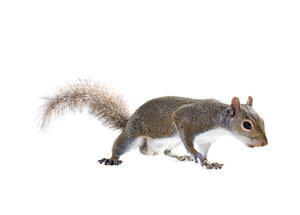 It is best to call us to evict the squirrels from your home before any squirrel problems begin.